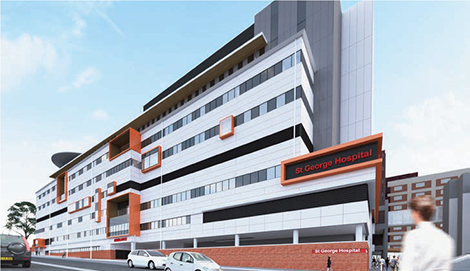 St George Hospital in Kogarah, Sydney, is currently undergoing a $307 million redevelopment. The centrepiece of this redevelopment is a new eight-level Acute Services Building, which will include an intensive care department, eight operating theatres, 128 additional inpatient beds and a rooftop helipad. The architect for this new structure, Jacobs, is an international firm with expertise in the healthcare sector, having designed hospitals and medical research centres across the world. Jacobs’ work in the healthcare space is driven by cutting-edge research and innovation. They design state-of the-art facilities with a focus on maintaining high patient care standards and promoting patient safety. A 2015 research report by The Centre for Health Design stated that “maintaining environmental cleanliness is critically important for the safe and efficient delivery of healthcare”. With healthcare-associated infections a major issue in the quality and safety of healthcare, it is imperative that architects and designers give priority to this issue in both the physical design and fitout of medical facilities. One important aspect in the design of hygienic healthcare spaces is the specification of plumbing fittings, including sinks and toilets, which have both been linked to infections occurring in hospitals. Well-designed sinks and toilets can not only help to reduce the incidence of bacterial growth, they can make cleaning easier, contributing to improved hygiene standards within hospitals and healthcare facilities. With Caroma’s extensive range of toilets and sinks specifically designed for optimum hygiene, Jacobs specified Caroma products for the St George Hospital Redevelopment. 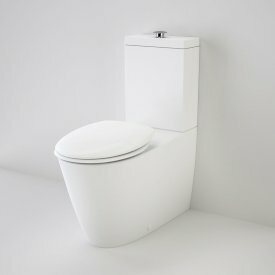 The Urbane, Liano and Care 800 Cleanflush® Wall Faced Toilets were specified in the design, each incorporating Caroma’s Cleanflush® rimless technology. The essence of Cleanflush® is that the rim of the toilet bowl has been removed, meaning there’s no rim to try and clean underneath and one less place for dangerous germs to accumulate. 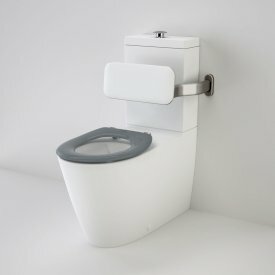 The absence of the rim, teamed with Caroma’s innovative Flow Splitter and Sculpted Flow Contour technology, allows for a whole bowl flush, giving a cleaner and more hygienic toilet. The Care 800 was also specified with a backrest, making it AS 1428.1 compliant, which is essential for patients with temporary or permanent limited mobility. 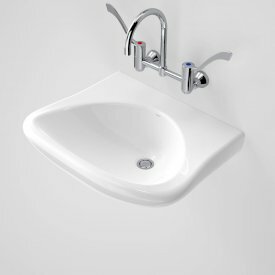 Jacobs also specified Care 500, 600 and 700 Wall Basins in the hospital redevelopment. 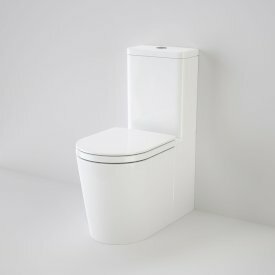 Care 500 and 700 basins are designed to meet Type C basin requirements under the Australasian Health Facility Guidelines Part D – Infection prevention and control, which makes them appropriate for public, patient and staff amenities in the hospital. 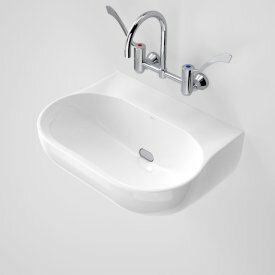 These basins are also fitted with the Caroma Care Shroud, which covers the S-bends and drains underneath, thus eliminating another bacteria trap and making them easier to keep hygienically clean. 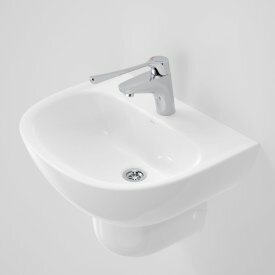 Care 600 basins are designed to meet Type B basin requirements, making them appropriate for patient care areas requiring hand hygiene by staff and visitors. 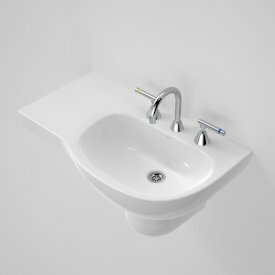 The optimal basin waste and tapware landing projections of these basins have been designed to significantly reduce backsplash, which has been associated with patient infection. They also have fully integrated shrouds for enhanced infection control. 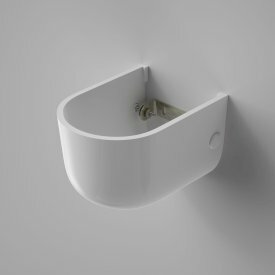 Caroma Wall Hung Medical Basins were specified for surgical areas, offering an easy-clean streamlined basin enabling the highest standard of hygiene.